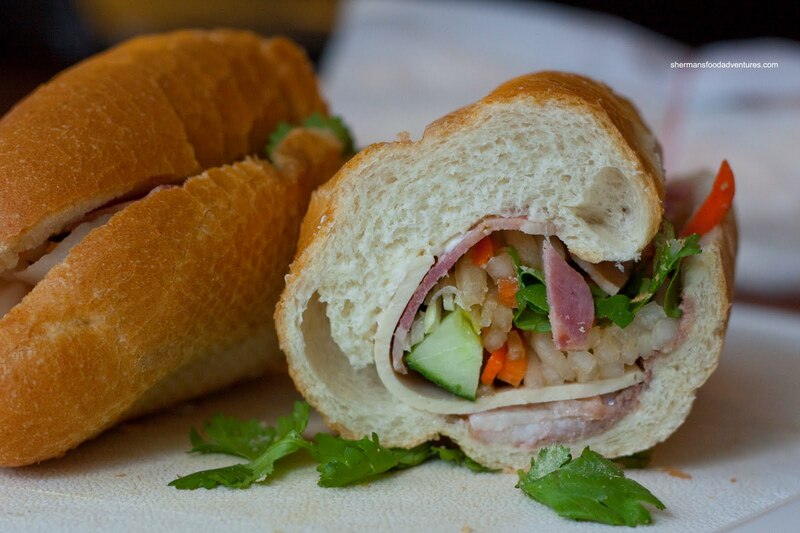 The Banh Mi is such a versatile food item. Think of it. Much like a sandwich, it is portable and accessible. 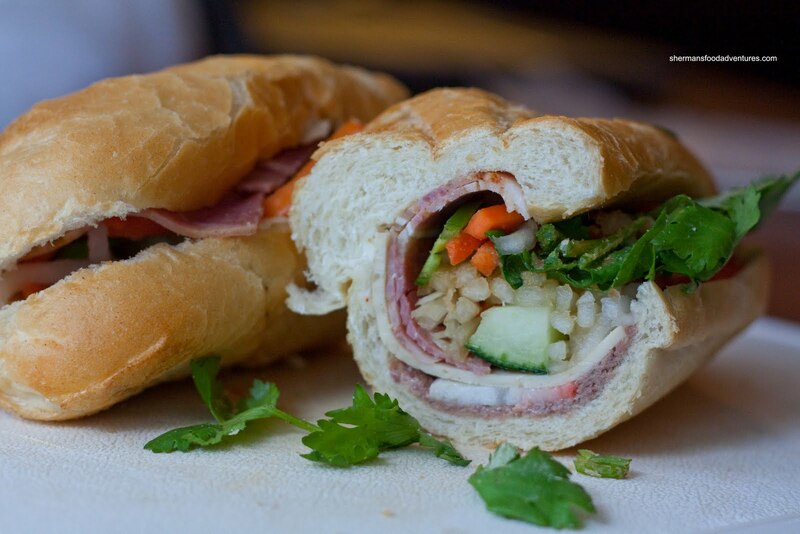 Unlike a sandwich, the Banh Mi has remained relatively inexpensive. It's true. The humble sandwich has been elevated to "gourmet food" status which ultimately means $10.00+ for one is the norm. Look at places like the Dirty Apron, Meat & Bread and Big Lou's. Now I'm not slagging those places; rather, I believe that their sandwiches are worth the price they charge. They are delicious, unique and generally a decent size. However, when we look at a Vietnamese sub, it is also delicious, unique and decent in size. The one thing that sets it apart is the price (oh and the ambiance as well I guess). You can get one for around $3.00 - $3.75, which is substantially less expensive than not only gourmet sandwiches, it is cheaper than most sandwiches period (think Subway, Sandwich Tree, Skyway etc...). 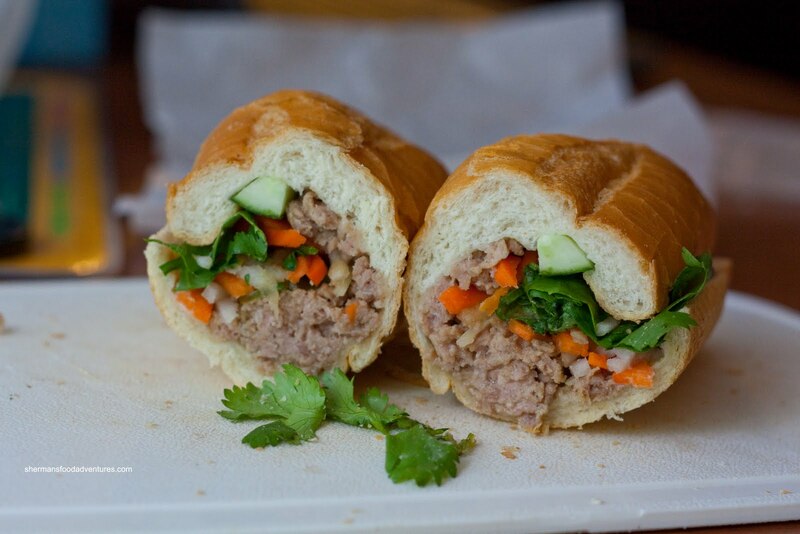 In terms of versatility, the Banh Mi is more than a quick lunch or even dinner (eat more than one), it can be a snack or even breakfast. 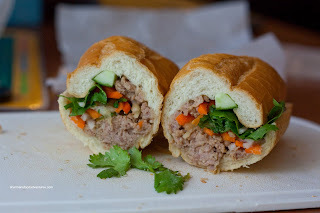 In all honesty, whenever I need a quick bite, I stop by a Banh Mi shop. Much better than McD's or a bag of chips. That was partially the reason I stopped by Chong Lee Market. I was in need of a snack and Viv was in need of lunch. Generally, I'm not that fond of parking at Chong Lee since the lot is not exactly user-friendly. The spaces are only suitable for a Honda Fit. Whatever, I found a space and besides, it wasn't the first Tuesday of the month (it gets crazy in there!). I decided to get 3 subs - Special, Cold Cut and Meatball. Honestly, there is not much difference between the Special and Cold Cut. Both seemed to have nearly the same types of meat, pate and other ingredients. Whatever the case, both were pretty decent. The bread (which appears to be supplied by Ba Le) was crunchy and not too heavy. There was a strong pate and Maggi sauce taste which gave plenty of flavour. As for the Meatball, it was not as flavourful as I would've liked, it could've used more onions. Yet again, it was also decent where the meat was moist and not too fatty. Hey, not the best Banh Mi I've had; yet it did the job. Hey! And it wasn't on Kingsway either! Come on man, I'm tired of the "its ok but there is better"
I think I end up skimming the posts to the end so one day I can read DEAR F***ING LORD THIS IS THE BEST FOOD A MOUTH CAN TASTE! I MOVED OUT OF MY HOUSE AND NOE LIVE IN MY CAR IN THE PARKING LOT IT IS SO GOOD DEAR LORD SOMEONE KILL ME. And then, I go there and eat. At the risk of stealing Sherman's answer, but, from a (former) blogger's perspective, there will be "better"; however, it is a question of whether you are willing to pay the price to get it. Of course, the price ain't necessarily in terms of $$$ but also time and other factors. In the meantime, most of these places we usually refer to "OK, but there is better" is in reference to places you can get a quick fix (and be satisfied) without having to drive extra Kms. Well, I guess its down to common sense, if I was to grade which top grossing fast food joints are "best', it would be probably Wendy's then Mcdonalds then Burger King/KFC. Its all personal choice though..
Its seems I trust the food bloggers I follow so I want to hear from them, whats THEIR best, even if #1 is in Chilliwack, then I'll visit #2 because its closer. he has that in the My Picks section, I just want to see more categories like he does with Dim Sum. 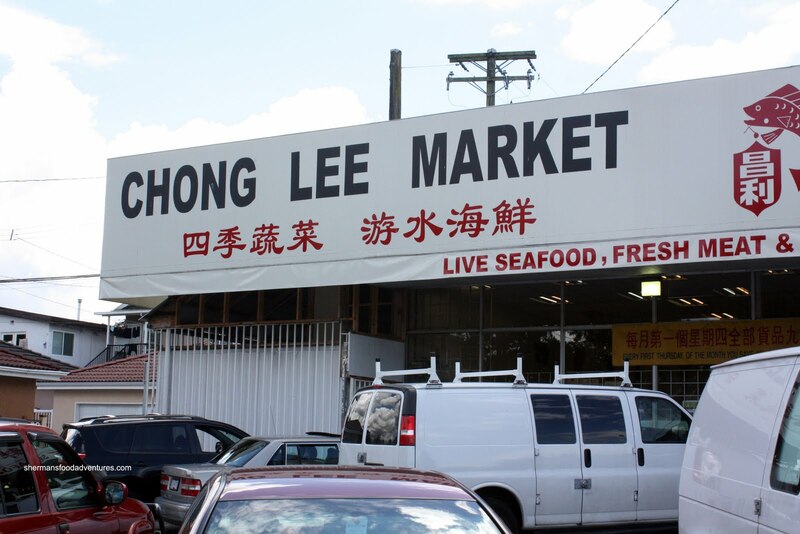 @Etienne LOL... Well, becuz there is better than Chong Lee. :) Seriously, the reason why I hedge my bets is there is always going to be better. I just have to find it. However, if you read my post on Pizzeria Farina, I pretty much said it was the best in town. @KimHo Yah, that is a good point too. Location is a factor as well. @Etienne Don't worry, gonna update that when I have time... When I find time!